In 1946 Aboriginal pastoral workers in the Pilbara staged a daring strike over their unjust and inhumane working and living conditions which became known as the ‘Pilbara Strike'. Don McLeod, a white man with a mining and business background was a key figure in coordinating the strike and working with Aboriginal communities in building their own economic and social structures. This was an unusual and personally risky position for a white man to take at the time, and until now not a lot was known about Don's background or motivations. 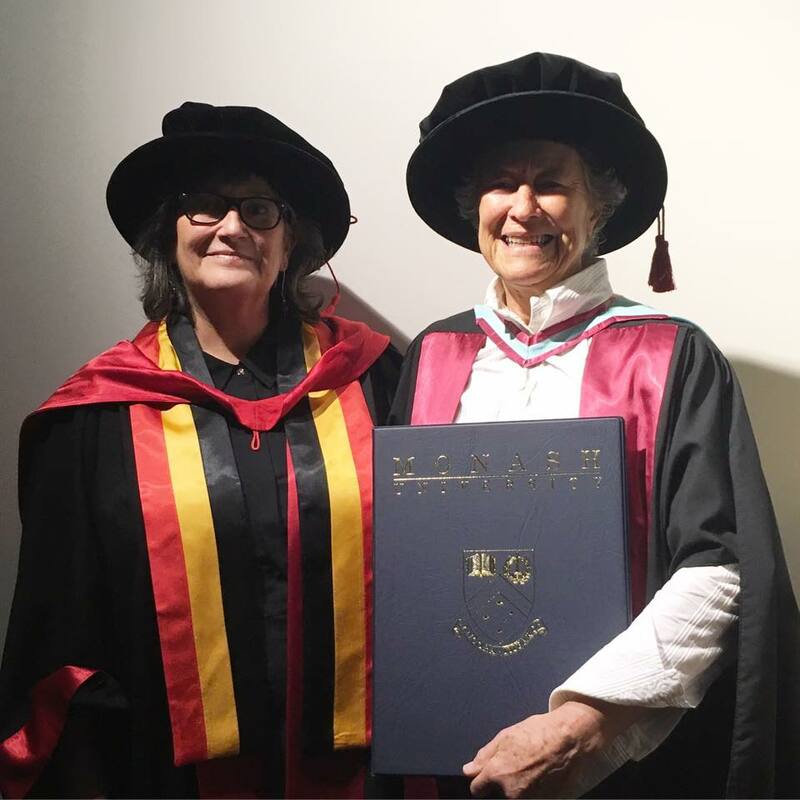 Dr Richardson, who together with her husband Stan Davey had known and worked with Don, has recently completed her Monash PhD on Don McLeod and shares insights about her own personal PhD journey, and the incredibly inspiring and humbling life and work of her subject. What inspired you to do this PhD? Since 1968 I’ve wanted to do the biography of this man, Don McLeod. He was a white man working for Aboriginal people in the Pilbara of Western Australia. My husband Stan Davey and I worked with him and the Aboriginal people in 1968/69 and we kept in touch for years and years afterwards. I could see that he was an extraordinary Australian man – in my eyes a hero – for sacrificing his entire life as an adult man to work for Indigenous Australians. He sacrificed marriage and was celibate for the rest of his life as he did not want to be anywhere near the category of men using ‘comfort women’. It was a huge sacrifice. Don had also been a successful prospector and miner, a hard-working businessman who could have become a very wealthy man. He was born in 1908, which made him a man in his prime for developing his own wealth and career in the 1940s. He gave it all away to work with the Aboriginal pastoral workers to help them achieve freedom from conditions of virtual slavery in the Pilbara at that time. I had such admiration for him. He had no family of his own, so there are very few records about him. He’d never talk about himself. Whenever I was talking to him, he was talking about the job – the work to help the Pilbara Aboriginal people achieve their goals. I knew his story was important and it would be hard to find the pieces and put them together – in particular to answer the question of why he did what he did. Why did he sacrifice marriage? Why did he leave his affluent and potentially prosperous business life? Why did he give it away to work for the “other”? What so inspired him about the Aboriginal people that he wanted to devote his life to them? I knew that with his assistance, the Aboriginal people had achieved extraordinary things such as setting up a Proprietary Limited company, setting up the first Aboriginal controlled school, setting up an Aboriginal controlled medical centre – all through their own work. Why I thought I would dare to do the Don McLeod biography – which had never been done – is partly because Stan and I had lived with Aboriginal people who were living by their traditional law and they had trained me in how their law worked. So, when McLeod said he had to do this or that, I understood he was following the Aboriginal leaders. But should a woman write a man’s biography? What right do I have to interpret his life through my female eyes? But, I actually think it was quite interesting because I asked different questions, such as: How did he eat? What was he eating? What did he do without intimate companionship? How did he deal with his solitude? For many, many years I have carried the desire to do this man’s biography. We kept in touch throughout the years and he died in 1999 when he was nearly 90. I knew I had to deal with the fact I thought he was an Australian hero, which was bias. In academia that was something I had to deal with. I was working to support my family, so I had to wait until my family had grown and I could leave the paid workforce. So at the age of 72, I thought this is the time to start. I also knew I needed academic help to do the research, that’s why I applied to Monash to do a PhD. What was your starting point for this biography on Don McLeod? I had no idea how I was going to begin the research. I met other people who said, “Yes, I was going to do Don McLeod’s biography, but decided I couldn’t.” When I started, I realised why they couldn’t … it was really hard. I started off with the question: How did they communicate to organise a strike on over 20 pastoral stations when they didn’t have telephone or vehicles and were kept isolated? We know that in 1946 the Pilbara Aboriginal people who were working on over 20 pastoral stations throughout the region – separated by hundreds and hundreds of kilometres – went out on strike. They walked off the pastoral stations. They were kept isolated by Western Australian legislation that required people who wanted to employ an Aboriginal person to get a permit. And to get a permit you had to be a person of good character according to the government agencies. Of course, Don McLeod was not considered a person of good character because he was helping them become equals. It disrupted the pastoral industry. So how did they communicate to all go on strike? And it comes back to Don McLeod who gave them an incredibly sensible, simple and culturally appropriate system for organising the strike. Then, I asked the question: Why? What was he doing that he dared to cross the cultural divide, to step outside from his own society, to put himself there in a position to be considered a traitor to his own kind? To assist Aboriginal people to walk off pastoral stations was going to totally disrupt the pastoral industry which was supported by government legislation that said the Aboriginal people had apparently signed an agreement that they would work on a station. They might not have known they did that, but if they walked off the station, the station boss could ring the police who would get them back. So, why did Don McLeod expose himself to the wrath of the pastoralists, the power of the police, the power of the Department of Native Affairs, the power of the politicians? A lot of the politicians in Perth were related to the pastoralists, so it was possible for them to influence legislation for anything they wanted. It was all geared toward preserving the pastoral industry, which was economically very important for the state of Western Australia. Why did this one white man put himself in such a position of vulnerability? So, I started investigating that. It’s not just a technical question of how did he help them, but a question of why? That was a very difficult question to answer because there was nothing available. Later, after the strike happened in 1946 I could find quite a lot written about it and McLeod. The strike went on for three years but then some of them went back again under threat of jail. McLeod got arrested, he got put in jail. It was a really savage fight and there’s quite a lot tracked especially in government files and once ASIO (the Australian Security Intelligence Organisation) got onto McLeod. But, before 1946 there’s hardly anything written. So where and how did you gather evidence? Through Monash, I was also financially supported to go over to Perth and get plugged into this invisible network of people who still remembered him and were able to give me some clues. But more than anything, I discovered in my own possessions an old reel-to-reel tape recording. I searched around and found a company in Sydney that could digitise reel-to-reel. I couldn’t believe my luck! I sent this tape up and when it came back it was a conversation that Don was having with Stan one night in 1968 (I wasn’t there). They were just having a yarn – you know that because Don was a chain smoker and you can hear him continually lighting roll-your-own cigarettes. Obviously they were just squatting on the ground, Don is smoking, they had a billycan of tea and the situation was just right when Don started telling the story of his early life. It was a miracle. I know that he was aware of the recording because he says, “Is that tape on, Stan?” In terms of academic rigour, I’m not stealing a private conversation; he knew it was being recorded. I was in Melbourne; Stan posted the tape to me to transcribe it. I remember doing that: I actually found pages one, three and five but I didn’t find pages two and four. When I listened to this thing, I could add in pages two and four. I’d posted it back to Stan and Don so I knew I’d had permission to access it and knew Stan would give me permission to use it in a thesis. And so, there is Don talking about his early childhood. Did this give you an answer to your question of why? His conversation with Stan explains how he got brutally treated in the convent he had to board at from age four. I say that’s how he learnt about injustice and explains why, in 1937, when he met the Aboriginal people, he saw something that nobody else saw: that one of the Aboriginal old men was very ill. Don said to the station owner (who was a friend of Don’s), “What’s wrong with that man?” The station owner said, “Oh, he’s just crook.” And you’ve got to remember the racial divide. So Don, instead of just agreeing the man was sick, said he’d take him to hospital. That was the first act of a compassionate man who stepped over that racial divide. They said they didn’t know why they had to work on these stations and if they walked away the police could catch them and take them back again. “We don’t know why, it’s our country. And, we don’t know what to do about it.” Don McLeod said, “I will help you. There is something you can do about it.” And, he did. If I had not had access to that conversation, I could not have explained why he was different; could not explain why he was so compassionate. He’d put his own life at risk to step over the racial divide. Because of the gift of that one conversation – which went on for an hour and I remember typing six foolscap pages – I had insight and then I could start trying to seek other evidence. Because the biography is a PhD that has certain academic standards, I had to try and find out if he ever did go to that convent or was that just a figment of his imagination (he’s 60 when he’s telling the story). He might have made it all up. That’s where my PhD supervisors came in – they challenged me. I’ve got this story and I’m full on with this story and they’re saying, “But how do you know it's true?” I had to find the evidence. Creating something with academic rigour is no easy feat. What kind of support did Monash’s graduate program offer you? I was accepted as a mature-aged student; my husband’s died; I live on my own; I was really vulnerable to giving up; and I’ve also got this really serious disability, but Professor Lynette Russell, Head of the Monash Indigenous Studies Centre accepted me as a student in the Centre and allocated me an office with a computer. And the Monash Disability Support Services interviewed me and asked, “What do you need?” which was a brilliant question. I said I needed voice activated software so I could speak into the computer and it would type what I say. I learned to go to the libraries and access documents but a normal, two-handed student could go and copy documents, which I couldn’t do, but I could pay the archivists to copy the files. I had all these packets of correspondence which were the keys to my thesis. I said I needed some help dealing with these papers because I can’t turn the page; I drop them. Through disability services they gave me two hours a week of a typist. The typist, Merav, was absolutely brilliant, and she was allowed to come into the university office and sit at the computer to type up the highlighted parts of evidence I’d found. As a thesis student, I had access to the librarians, the subject specialists and in particular to Document Delivery services in the library. They were brilliant. I could get a reference to some obscure little thing I couldn’t find myself. I’d ask the Document Delivery people and within three weeks, there it is! They certainly know how to find things. Some progressive librarians also organised regular casual meetings in the library for our PhD peer support group and helped us with things we didn’t want to bother our supervisors with – like how to use Endnote. And if nobody could answer, they’d bring in an expert to help us. They were always cheerful, supportive, and wonderful. It was the intellectual and emotional support system that held it all together. I think I’m incredibly lucky. I had my supervisors, I had the disability support services but also the people who manage the parking for people with disabilities who are carrying big backpacks of books so they can get across campus without dying. In my acknowledgements, I thank the parking officers. They were so wonderful. Monash was incredibly helpful to me. I really couldn’t have done it without Professor Lynette Russell taking me in at the Monash Indigenous Studies Centre, giving me an office and computer with a voice activated program. And of course it was heaps of fun for me being in the Indigenous Centre because I could fraternise with all the academics and other students. Wonderful. I had such a good time. I was so privileged. So, that’s how I managed as a mature-aged and disabled student to undertake this research. Can you tell us more about the role of your supervisors? “It’s your thesis. If you think you can do it and meet our criteria, we’ll support you.” It was a fantastic act of faith. Professor Hocking is a biographer. She did the biography of Gough Whitlam, two volumes – huge. I needed her guidance about how to do this micro-history. How you balance the historical background with the detail you need to write the life of this person because everything they do is within the context of their life. Don McLeod would be irrelevant today – totally irrelevant because there is massive government funding for Aboriginal enterprise. There are multiple numbers of Aboriginal organisations. There’s land rights and native title. The Don McLeod model of “if-you’re-willing-to-work-hard-do-it-yourself-and-sacrifice” to gain independence is less relevant to the way Aboriginal people improve their own wellbeing today. So, the historical background was vital, but if you go too far into the historical background you lose the man. That was always my problem. I kept losing my man. I also kept getting excited about convicts. The British Government sent convicts to Western Australia for 18 years, but they would not send convicts to the North because the tropics were too hot. If the pastoralists had been able to draw on the labour supply of the convicts, they might not have co-opted Aboriginal people. That explained why Aboriginal people became a vital part of the pastoral industry. You can carry on about that. You can go deeply into other activists — earlier in the 1930s and even earlier, who were alerting Britain to the fact that men outside the Aboriginal group were sexually exploiting the women and were treating the Aboriginal people as slaves. But I kept losing my man. This is about the man. That’s the important thing and there was actually a big link. Before they allowed sovereignty of Western Australia, Britain wanted to insert a section into the Western Australian constitution that said Britain would retain control of money to support Aboriginal people because they’d heard all these things about the treatment of Aboriginal people. Under that section, it was instituted that there was to be a certain amount given, or if the gross product of Western Australia exceeded this amount, then it was to be 1%. After Britain granted sovereignty to Western Australia, the Western Australian parliamentarians started arguing against it and got it withdrawn. That was the first injustice Don McLeod understood; he discovered it. He went to Perth and fossicked through the library documents right back to the founding of the colony of Western Australia and he found this “sleight of hand” – that’s what he called it. He used the short-hand signifier – “the 1%”. And he helped the Aboriginal people sue Western Australia to recover what they were owed. And it was Professor Jenny Hocking, being the biographer, who asked, “Where is McLeod in all of this?” She was able to guide me there. Of course the question about McLeod was: What is a miner and prospector doing in the Perth library reading the documents of the Constitution of Australia? After all, he left school without what today would be Year 12. He was a businessman. Most people know him as this radical activist because of his political work in 1946 and earlier, but before that he was a businessman. He’d followed his father who was a wealthy prospector and a miner (because he had a mine he sold and made profit). The young Don McLeod had learnt mining from his father. So even though he wasn’t formally educated, he was very smart. He’d learnt a lot from the international miners who’d come to mine for gold in the Pilbara. He was a great listener and he had that intelligence that is highly developed in people who communicate orally. In his business career, he’d gone down to Perth and he knew how to go to the library, but it was still extraordinary to me that in his search for the origins of Aboriginal injustice in the Pilbara he was led to the founding documents of Western Australia. What did McLeod do then? Senior Aboriginal leaders invited him to a law meeting – it was a huge meeting he said only occurred every fifty years or so. Aboriginal people came from as far as Alice Springs and Darwin. All the senior lawmen representing all the tribes. And one European man. Because they trusted him. They talked about their law then said they wanted him to talk, to tell them what he’d found to answer their question: Why we can we be arrested if we leave the station? So, he told them what he’d found about the constitution and that they could go on strike. They appointed Don McLeod to be their representative in the western realm. They said, “You’re our man. You can read and write and talk. We’ll tell you what to do, that’s your job.” They appointed him, they gave him a voluntary job, they allocated a portion of their traditional land to him and they gave him symbols of their authority. The Premier of Western Australia said, “You think you’re the representative of the Aboriginal people, well you know what, the Western Australian Government manages the Aboriginal people. You have no standing.” But, in their eyes, he was their man. So how did they all go on strike? Despite the risk of McLeod being arrested – and he did get arrested and jailed with hard labour – he worked with them coming up with a simple and brilliant way through understanding their culture. He went out in the bush, talking to these people where he couldn’t be arrested. He tore the label off a jam tin and all he had was a bullet, not a pencil. With the bullet, he drew a whole lot of boxes, which he knew they’d understand as a calendar to mark every time the moon went down. We’ll put a circle around the 1st of May”– which has international repercussions of course – “When it comes to that, we walk off.” Absolutely brilliant! I try to imagine what would have happened if he hadn’t been there because he helped them break the system. Once they’d all walked off the station, there were about 800 of them, how do you feed yourself? But because of his particular skills, because McLeod was a prospector and a miner, he said, “I'll identify mineral-bearing rocks and I’ll help you to find more like it.” Picks, shovels, crowbars, dig that rock out. Don was a miner and he knew how to get the rock, how to break it down, how to put it in drums, how to send it around to brokers in Sydney and sell it on the international market. So, here are these illiterate tribal people selling on the international market through Don McLeod. Amazing. What are some of the other highlights in your research? This is the first time Don McLeod’s life has been studied. Whilst there’s an awful lot that has been written about the political aspects of his life, his actual personal life, especially before 1946 hasn’t been really looked at. So the highlights are really the answers to questions of: Why? and How? I think I’ve answered the why, but then the question of how? He joined the Communist Party – that is well known – but what’s not well known is when and why he joined and for how long he was a member? It’s critical because being communist in war time attracted a whole lot of attention and imputed a whole lot of motives that he may or may not have had. Who am I from my position in 2015/16 to look back 70 years to 1945/46 and try and impute somebody’s motives? I wrote to the Communist Party in Perth. They said the records were accidentally burnt, and besides, Menzies had declared the Communist Party illegal so people didn’t keep records anyway. Then the invisible network put me in touch with a man who’d just turned 89 and lives in Geelong. He was a member of an intellectual group in Perth in the ‘30s and ‘40s and knew all these people who knew Don McLeod. He painted the social picture of what was going on and could tell me that he met members of the Communist Party – the only party in Australia at that time that had a platform for Aboriginal affairs; the only people that had a policy. So, Don gets attracted to the Communist Party because they’ve got a policy and they said they’d support him. When the strike happened and Don got arrested, the conservative press wouldn’t print anything about it. They put a blanket ban on it so information wasn’t getting out, but it did get back to the Communist Party. The police always had a black tracker, or “police boy”. There was one who was working in the jail where Don was but he was part of the strike movement. He used to come past McLeod’s jail, McLeod would slip him a bit of paper, he would go and post it down to these people in Perth who then splashed it in The Tribune and Communist newspapers. This is how the Aboriginal voice got out. The Communist organisation in Perth had a socialist lawyer they sent up north to represent Don and the Aboriginal people who’d been arrested. The police had arrested all the leaders to try to stop the strike. They’d filled all the jails. Of course, in the Western court of law the plaintiff has to be represented. They were usually represented by the police, so the police had dual roles as Protectors. Then, here was this lawyer saying he wanted to represent them and he wanted to cross-examine. So, the transcript of the court cases had the Aboriginal voice. The native welfare officers said they’d never had Aboriginal people complain about anything to warrant going on strike, but because of this lawyer, they got to air their complaints. What’s one thing you learnt from your research that you’d like to impart? Don McLeod said to them, “What can’t you do? You are intelligent people. You are strong. You have all these capabilities and skills. You’ve got this amazing system of law. You have the power in numbers. What can’t you do?” And they proved it: What can’t we do? In 1946, McLeod was the right man for the time. He hadn’t done a degree, but he was a businessman and could challenge laws. The government wouldn’t give him a permit, so he established a Proprietary Limited company, which could get a permit to employ their own people. But not only that, he put in tribal elders as directors and they marked their directorship with a cross. As Don said later, nobody asks who your shareholders are. Nobody says there’s a rule that if you’re Aboriginal you can’t be a shareholder. Nobody asks what the addresses are. This company is set up for these people and the articles of this company say this company is set up to make money to support our people. Nobody says the company can’t do that; the company can do anything an individual can do except teach religion and vote. So, it can override all this legislation restricting Aboriginal people. They went out day after day after day with picks and shovels and crowbars; the men, the women and the kids, smashing the rocks and getting out the minerals to survive and continue the strike, and make a fairer living. And they totally disrupted the entire political and economic system through the strength of their resistance, their resilience and willingness to work hard and suffer for their independence. And Don McLeod was central to the Aboriginal strikers’ liberation from oppression. His life story deserves to be told and with Monash's support I have been able to undertake the necessary research – now to turn it into a book. Dr Jan Richardson's PhD is available through Monash University's Matheson Library (under embargo until 2020): ‘They couldn't break me': Don McLeod, champion for Aboriginal justice in the Pilbara.